as I revisited the piece in my mind while preparing this presentation. 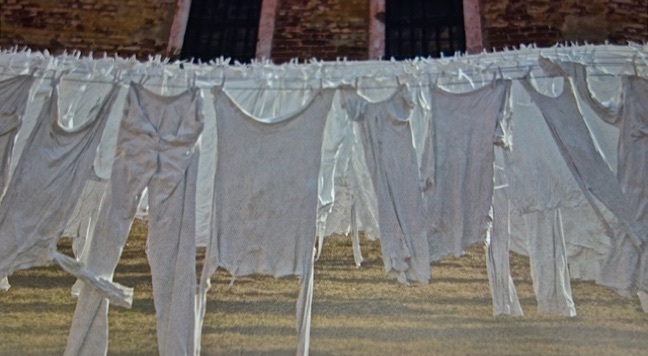 Prior to entering the first “station,” I encountered a series of photographs of laundry which had been hung in the actual “women’s yard” at Terezin during the initial staging of the installation. The women’s and children’s clothing, fashioned in a style associated with the early decades of the 20th century, had been bleached and stiffened, simultaneously representing transience and an absent presence. Who were the people that wore these clothes? What were their lives like prior to arriving here? What was their experience while they were here? The first “station” was a large room, in which everything had been painted various shades of flat grey, except for a table and chairs in the center, which were painted white. Upon entering, I noticed two suitcases, placed at an angle to indicate either an arrival, or preparations for a sudden departure. The laid table suggested that a meal had just been eaten prior to time, in essence, standing still. The only respite from the deadness in the room came from three small video projections, enclosed in frames like photographs, which hung on one wall. The projections were in color and showed a wedding taking place outdoors, those in attendance happy and smiling. I imagined these flickering images representing memories of the lives left behind by the various occupants who had come to use this room. Shh! Don’t talk…don’t make any noise…don’t even move. Maybe they won’t see me if I’m still and they’ll forget that I’m here…maybe I’ll forget that I’m here, also…I’ll disappear. The next two rooms were smaller than the first one. 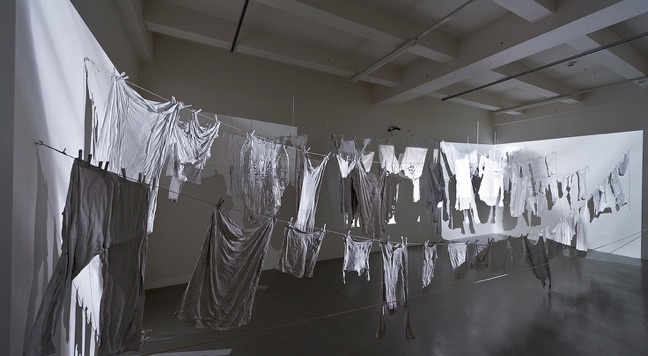 Lines of laundry hung from one side of the room to the other, effectively filling the space except for a narrow corridor in which viewers could walk, and/or stand. 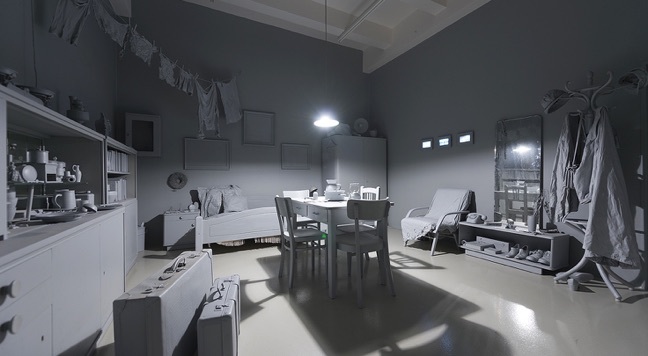 In both of these rooms, the only light emitted came from video projections of silhouettes; punctuating the darkness and creating an eerie sense of people – perhaps ghosts? – walking through the lines of clothes. In the second of the two rooms, the clothing had been painted with phosphorescent paint, creating a dimension of hallucinatory experience suggesting a psychotic state of mind. This space is closing in on me…I can’t think…Am I alive, or dead? I hear murmurs that keep getting louder but I can’t really see anyone…Am I alone?…What’s happening to me?…Wait, there’s a face…Do I know her? What’s her name? Where did she go? Whom did she leave behind? The fourth room was brightly lit and covered from floor to ceiling with words that had been hand-written in different colored pencil by the artist. Although I can’t read Czech I was told that the writings were dreams, possibly the dreams of Żenatá’s patients? 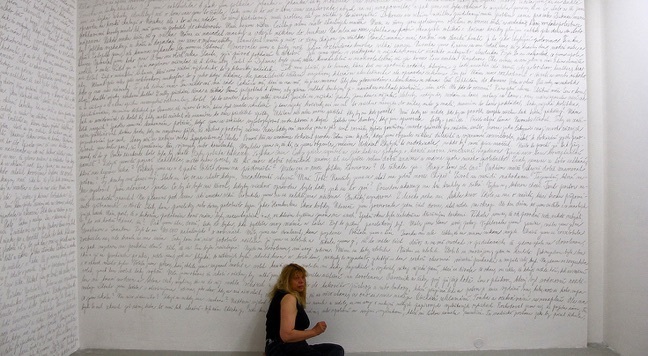 In the image, the artist has positioned herself in a crouching, near fetal position on the floor, with her body close to one of the walls. She seems to be listening to the stories—or dreams—told by the words written on the walls. There’s finally a bit of space to breathe…The voices are becoming clearer and seem to be almost embodied…they’re beginning to tell me a story…many stories…fractured, but rich with emotional meaning…if only someone would listen to the stories and be able to bear them with me…then I might have a chance to heal. The final room was quite a bit larger than the others. It, too, was dark save for the light emitted from several video projectors. 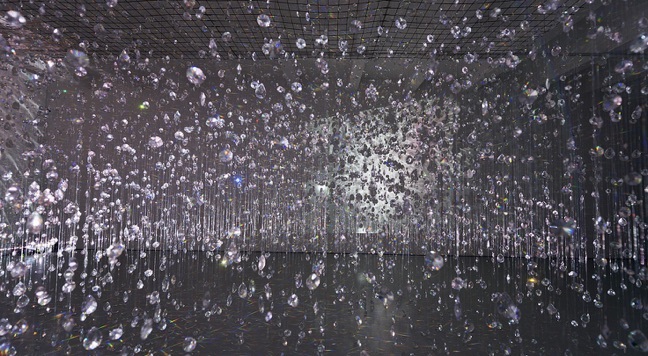 This was the room Ženatá called “Lamentation” and, in contrast to the horizontal lines of laundry forming a kind of virtual fortress in the previous rooms, this room was demarcated by vertical strings containing 10,000 Swarovski elements – crystal tears – that danced and tinkled with the flow of air in the room. Lit from below the crystals created prismatic bursts of color. Having taken this journey with Ženatá, it feels as if it might now be possible to change the shape of the shoes that each of us is wearing, thus linking our separate experiences of reverie through this moving, and evocative, work of art she has created. I depart feeling a deep sense of gratitude to Kamila for sharing her work, and herself, with me.